The Mister Bass Clef® teaches PIANO Technique series continually reinforces five-finger positions, chords, scales and arpeggios to help students remember them. Mister Bass Clef® teaches PIANO 5-Finger Patterns and Chords introduces the student to the 24 major and minor positions along with the 24 major and minor chords. Each 5-finger pattern is first played legato and then again using another technique - both hands staccato, RH legato and LH staccato or LH legato and RH staccato. As an additional challenge, the 5-finger patterns are played in different rhythms. As each new 5-finger pattern is introduced, the previous ones are reviewed. 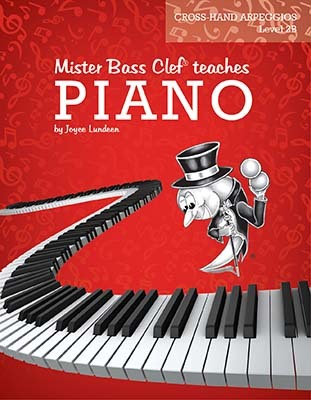 Mister Bass Clef® teaches PIANO 5-Finger Patterns and Chords is a Level 2A book. Upon completion of Mister Bass Clef® teaches PIANO 5-Finger Patterns and Chords, the student will have learned all the major and minor 5-finger positions and all the major and minor chords. Mister Bass Clef® teaches PIANO Cross-Hand Arpeggios introduces the student to the 24 major and minor chords played as arpeggios. Each chord is played first with the left hand and then with the right hand going up and down the keyboard. As an additional challenge, each chord is played as an extended arpeggio covering more of the keyboard. As each new cross-hand arpeggio is introduced, the previous ones are reviewed. Mister Bass Clef® teaches PIANO Cross-Hand Arpeggios is a Level 2B book. Upon completion of Mister Bass Clef® teaches PIANO Cross-Hand Arpeggios, the student will have reviewed all the major and minor chords and played them as arpeggios. Mister Bass Clef® teaches PIANO One-Octave Major Scales introduces the student to all the major scales and primary chords I, IV and V.
Each major scale is first played legato and then again using another technique - both hands staccato, RH legato and LH staccato, LH legato and RH staccato or with a crescendo on the ascending scale and a decrescendo on the descending scale. As an additional challenge, the major scales are played in contrary motion and in different rhythms. As new major scales and primary chords are introduced, the previous ones are reviewed. Chromatic scales are also included to be played in both contrary motion and parallel motion. Mister Bass Clef® teaches PIANO One-Octave Major Scales is a Level 3A book. Upon completion of Mister Bass Clef® teaches PIANO One-Octave Major Scales, the student will have learned all the major scales, the chromatic scale and all the primary chords. Mister Bass Clef® teaches PIANO Finger Exercises Level 3A includes Hanon's classic exercises along with other exercises. The exercises are designed to strengthen the fingers and develop coordination and speed. Both right hand and left hand notes should be played at exactly the same time. Start each exercise at a slow tempo and work up to the tempo indicated. 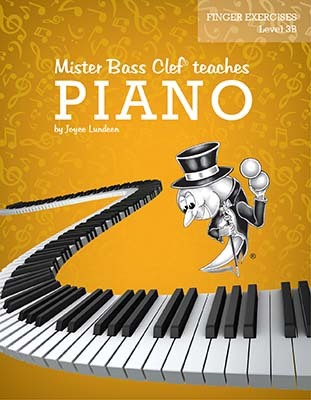 Mister Bass Clef® teaches PIANO Finger Exercises Level 3A can be used with level 3 of any method series. Mister Bass Clef® teaches PIANO One-Octave Arpeggios has the student review all the major scales, play the primary chords I, IV, V and V7 and learn to play the 24 major and minor chords as one-octave arpeggios. Each arpeggio is played with both hands together. Starting with the Key of C, the student will play the major scale, the primary chords and both the major and minor one-octave arpeggios. Then as each new key is introduced, the primary chords of the previous keys are reviewed. Mister Bass Clef® teaches PIANO One-Octave Arpeggios is a Level 3B book. Upon completion of Mister Bass Clef® teaches PIANO One-Octave Arpeggios, the student will have reviewed all the major scales, played all the primary chords I, IV, V and V7 in each key and played all the major and minor chords as one-octave arpeggios. Mister Bass Clef® teaches PIANO Finger Exercises Level 3B includes more of Hanon's classic exercises along with other exercises. Mister Bass Clef® teaches PIANO Finger Exercises Level 3B can be started after completing Mister Bass Clef® teaches PIANO Finger Exercises Level 3A.